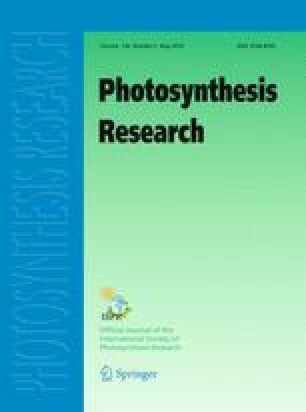 The relationship between charge recombination at Photosystem II (PS II), as indicated by millisecond luminescence, and PS II quantum yield was studied in spinach thylakoids during electron flow to methylviologen. Under the low magnesium conditions used, a decrease in quantum yield was observed in the absence of non-photochemical excitation quenching, and therefore cannot be due to a restriction in excitation delivery to the reaction centre. It was found that the decrease of the parameter Φp, which is a measure of the intrinsic quantum yield of ‘open’ PS II centers, correlates with an increase in luminescence per ‘open’ center. The relationship between these two parameters was the same whether Φp was manipulated by dissipation of the transthylakoid pH gradient or of the electrical potential. This indicates that the mechanism by which Φp decreases depends in the same way on the two components of the protonmotive force as does the charge recombination at PS II. Calculation of the yield of luminescence with respect to the back reaction will be necessary to determine whether the charge recombination occurs at a sufficiently high rate to be directly responsible for the Φp decrease.